Music brings people together. By investing in music, we’re investing in connecting our communities – creating spaces where we can all feel accepted. We’re giving artists and local performers the opportunity to reach their full potential. Providing them a stage to perform on elevates our music scene and allows the audience to experience something special. We hope you enjoy the show. 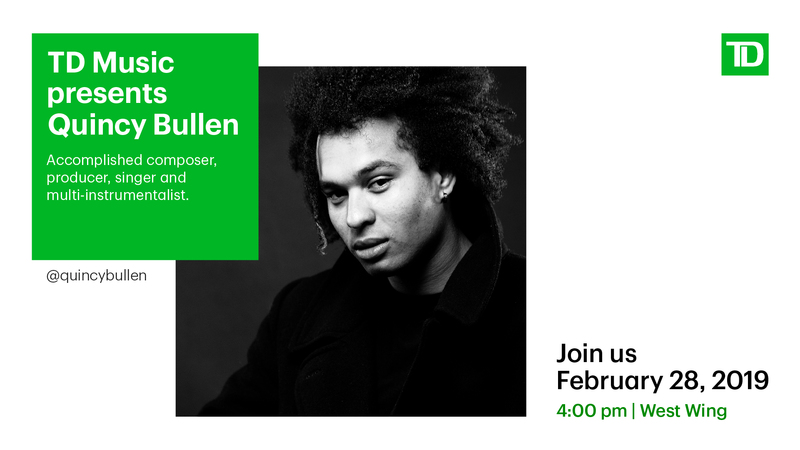 Join us in the West Wing at 4pm for TD Music Presents: Quincy Bullen, accomplished composer, producer, singer, and multi-instrumentalist. Visit www.TDMusic.com to learn more.